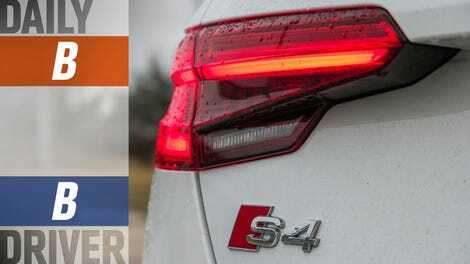 The 2018 Audi S4 doesn’t look special. From a distance, it looks like any other Audi sedan—a pattern Audi recognizes and could change one day. But it’s when you get up close to the car, when you start to see a red tint to the leather and a diamond stitching in the seats, that you know there’s something more to it. 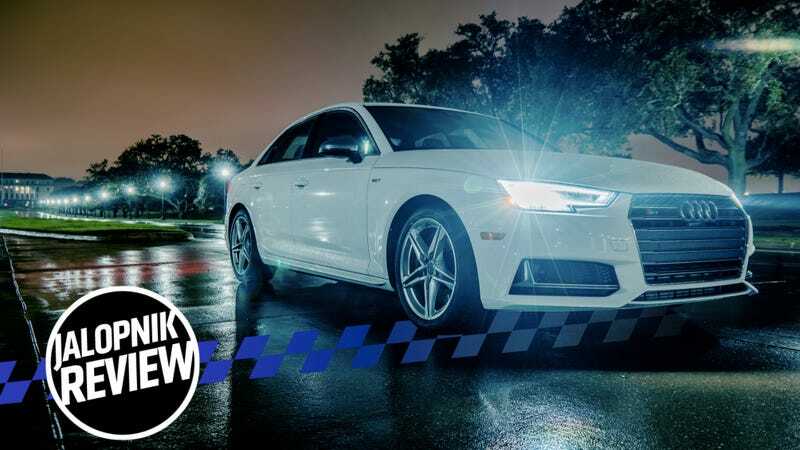 The S4 has been around a while, and though it may not be the first name you think of anymore when you consider performance sedans, it’s good enough that it still makes a strong case for fast four-door cars. The tiny details like the stitching, the things that make you tilt your head a little and wonder what the whole idea was behind this thing, all start to make sense once the S4 fires up. It may not have a supercharger under the hood like its predecessors did, but the car is loud and angry enough to transform anything you thought you knew about cars that get the copy-and-paste design treatment in a dying sedan market—in a good way. Audi’s S badging slots in between its standard models and highest performance ones, meaning the S4 isn’t as wild as Audis can get. That’s an RS, but the S cars are more than just sporty looking and fast. The S4 is a more driver-focused derivative of the modestly sized A4 sedan. The 2018 S4 is powered by a 3.0-liter turbocharged V6 rated at 354 horsepower and 369 lb-ft of torque. It has Audi’s eight-speed tiptronic transmission (remember, it’s not a dual-clutch transmission anymore) which adapts its shifting based on a person’s driving style and can be manually shifted with paddles whenever the driver wants. At nearly $70,000 in the trim I tested, the S4 is not anyone’s starter car. It’s not even your typical car, for a number of reasons. While it doesn’t look much different than the previous generation, this current iteration of the S4 was a big departure from its past versions. Audi swapped a supercharged V6 for a turbocharged one, which resulted in more horsepower, higher torque and better gas mileage on this version of the car. But Audi left some important traits of the S4 behind, like the aforementioned DCT and the option to get a real, three-pedal manual. That was a bold move, and in a car market that’s killing sedans off just as fast as it’s introducing new crossovers, it made us question if the S4 still mattered. And it does, perhaps for that very reason. Bland crossovers have become the universal language of the people. The few four-door cars that actually survive the sedanocalypse have to set themselves apart, and the S4 certainly isn’t ordinary—even if Audi let one of its most defining features slip away in not offering a manual variant. The only thing that doesn’t stand out about this car is its exterior, but that’s kind of part of its charm. Its aggressiveness is unexpected. Any doubts about the S4 being a sport sedan disappear upon opening the door. The red leather screams “Drive me, I’m fast,” and the speed that’s delivered doesn’t disappoint. The interior, in addition to looking sporty with the leather and a $500 upgrade that adds accents made of carbon-fiber mesh, was also refreshingly simple: There aren’t buttons and controls that you promise yourself you’ll learn eventually, but never do. And the steering wheel’s sleek simplicity is as nice as it is functional. The S4 has a simple dash and a clean display, which adds to the airiness of the cabin. The car feels like it has a ton of room in the front seats, yet doesn’t feel overly huge when driving. It’s cozy with room to stretch a little. There are also incredibly handy lights all over the cabin. The temperature knobs light up with the setting that you’re adjusting the vents to, and the car also has lights lining buttons, cupholders, exterior doorhandles and accenting the interior of the car. It makes things easy to see without being distracting. But by far the most surprisingly great S4 features were its backup cameras and stop-start system. The first time I put the car in reverse while parking, I had to stop for a few seconds and stare at the screen. The camera angle, pieced together from all of the car’s exterior cameras, shows a simulated aerial view of the car and scenery around it. This kind of 360-degree camera we’re starting to see in everything from Ford F-150s to Nissan Rogues works beautifully in the S4. It made parking a four-door car in my curvy driveway mind numbingly simple, as opposed to the typical forward- and backward-facing cameras that a lot of infotainment screens show. Like with any fancy car I drive, the stop-start technology was the thing I was looking forward to the least. Stop-start systems shut the car’s engine off while idling as to stop it from using fuel and pumping out emissions for a short period of time, but they’re often so annoying that it doesn’t feel worth it. The S4’s stop-start system, though, is the best I’ve ever experienced. It isn’t even in the same zip codes as others, like the 2017 Mercedes-Benz E300. I turned that one off right away. Stop-starts are often jerky, loud and incredibly noticeable, but this one wasn’t. The car started quietly and smoothly, and it was so fast—the S4 was ready to go before I could get my foot from the brake onto the gas while consciously trying to beat stop-start system. It was incredible. In full disclosure, I can be what you might call intensely frugal. I’ve been known to fiercely protect my home-electricity costs to the point of people being afraid to turn on lights in my house. The loud engine noise doesn’t feel artificial, although it sounds just the same as the previous generation of the S4 did—fed in by a computer. Jason Fenske from Engineering Explained pulled the sound fuse on the S4 in a YouTube video from 2015, and its growl got noticeably less angry. Fake noise or not, the car was fast enough to terrify some of my in-laws during Christmas. Any turbo lag was only really noticeable if you were paying close attention, and the car felt light for 3,858 pounds. The brakes are strong and pull the car to a stop easily, too. The S4’s heads-up display showing the speed limit, the car’s speed and other information is typical for a vehicle in its price range, but it’s helpful nonetheless. It also has straightforward commands for its adaptive cruise control, which actively manages your following distance in traffic. But not all of the warnings in front of the driver are clear, like when a green foot shows up to apparently tell a driver to remove their foot from the gas because a situation ahead requires slowing down. Lane assist in the S4 is also weird, and appeared to just turn off if a driver didn’t heed the car’s warnings to take control of the wheel. It was strange that the car was programmed to tell a driver to take over during lane assist, too, since a lot of cars just ask for a tap of the wheel every however many seconds. But, honestly, taking control of the wheel back from the car isn’t all that bad—especially in the winter. The S4 has a surprisingly powerful wheel heater, and I sure missed it when I got back into my third-of-this-sticker-price personal car. It’s wild how a well-handling, powerful car can make a person so much more comfortable being aggressive. The S4 is like that, so I took it on what local motorcyclists call the “taco run”—one of the only winding roads in my area of Texas, and probably all of Texas, which ends at a taco stand. The S4 has several driving modes, with the top being “Dynamic.” (If you won’t give us a manual, Audi, at least kill this word already.) When a driver isn’t using the paddles and floors it, the car shifts at 6,250 RPM in Dynamic mode, which is just under its 6,500-RPM redline. It’s a hard and abrupt shift like most automatic sports sedans have, and it’s fun. Outside of flooring the car to see how quickly it’ll get up to speed, there isn’t a huge change, feeling wise, from the baseline Comfort mode to Dynamic. The S4 is jumpier on the throttle in Dynamic, but it didn’t feel like there was any major suspension change between the two when driven hard. The S4 had more body roll through turns than expected, though it lessened depending on where and how long I carried the brake for. The weight noticeably shifted to the outside of turns regardless, and although that kind of uncertainty can give an adrenaline rush, noticeable body roll like that probably wasn’t the goal with this car. There was also some noticeable understeer, which is typical for all-wheel drive. Steering response was a little late no matter whether the car was being driven hard or casually, but, again, that wasn’t hard to adapt to. There weren’t many disappointments about this car, really. People who yearn for the supercharged generation of the S4 will turn their nose at that sentence (or do the internet equivalent and close the tab), but it’s true. This was a truly enjoyable car, supercharger or not. Virtual Cockpit is impressive, and easy to navigate if you’re used to it—but only if. It’s complicated here by the density of menus and options. The learning curve is steeper than some might anticipate at first. But it wasn’t just the screen and radio controls that were occasionally odd. I got used to the shifter (pressing a “P” button for park and moving it up or down for reverse or drive) quickly, but I never quite understood the controls on the side of the seat. There’s a button that makes the seat-massaging options pop up on the center infotainment screen, and then another button toggles between massaging options and intensity. I never figured out how exactly to do it, so I just left it on the default and went on with my life. Sure, I probably should have opened the door and looked to see if there were markings on the buttons saying what they did when I was outside of the car. But massaging seats are a thing of the moment, a beautiful and under-appreciated feature of this life that all but disappears from your mind when you exit the car, only to return again when you sit back down. The least enjoyable part of my time with the S4 was pulling into the gas station. Again, I’m cheap, so filling a 15-gallon tank with premium was like watching the meter fill up on that strength-testing carnival game after someone hit it with a hammer—my head being either the meter or the thing hit with the hammer. Or, actually, both. It didn’t help that almost every time I glanced at the dashboard gauge showing current fuel mileage, it showed about 14 mpg. That’s what happens when you drive a fun car to its full, gas-drinking potential, I guess. The Audi S4 tells everybody, with a modest push of the gas pedal, that you wanted performance in the guise (and practicality) of an everyday luxury sedan, and you paid for it—because, let’s face it, you did. The features in this model brought it in at an MSRP of $65,625, which means it’s for the people who don’t mind dropping a substantial home downpayment on a car. It’s also meant for people who want performance and a car that’ll roar off the line at a stoplight, but not necessarily to shift their own gears all the time. In the cockpit it’s a showy car, and it has the performance to back up its bling. A $65,000 price tag on a daily driver is a hard sell, especially in a sedan market that’s dying at the hands of the crossovers. But the fast, comfortable four-door car is still a useful and versatile platform. And the S4 is proof that it hasn’t been abandoned yet. Whether the S4 justifies its price is kind of up to the buyer, who will likely do some thorough research before going ahead with the purchase. A base 2018 BMW M3 starts at $65,500, whereas the S4 starts at $50,900 and this one had about $15,000 in optional packages. But BMW also rates the M3 at 425 HP from its turbo inline-six engine, and it comes in a manual transmission. A Mercedes-Benz AMG C 43 has a claimed 367 HP from its turbo V6 and starts at just over $54,000, so it’s really all about the options and specific features a driver wants in this price range. But if a lack of stick shift isn’t a dealbreaker, the red interior Audi offers for the S4 has a way of grabbing a driver and putting them in a state of complete entrancement. There’s just something about it. The Audi S4 is an incredible car, even if it doesn’t have the option for a manual transmission or a DCT anymore. It would be even more fun with those options, but the lack of them being there doesn’t remove its identity as a truly enjoyable, well-done sport sedan. Audi also did a great job of keeping the car simple yet luxurious—the interior has that bare feeling of a car for people who want to drive rather than ride in a rolling computer, but still feels like it costs a lot of money. If elegant, wealthy but still ready to have fun is the social vibe you’re going for, well, the S4 probably has it down far better than even you do. And it’s a car. Lots of interior and storage space, but will drink premium gas with no regard to your wallet. An incredibly fun car, but lacking some of its historically major features like the option for a manual transmission.